Lake Tahoe, on the California-Nevada border, has a new building for its Maritime Museum, opening next month. It looks really nice, but doesn't seem to have any rowing boats in it, judging by the website. This is a particular pity as the first recorded rowing boat on the lake was steered by none other than Mark Twain, who was a reporter on a newspaper in nearby Virginia City. 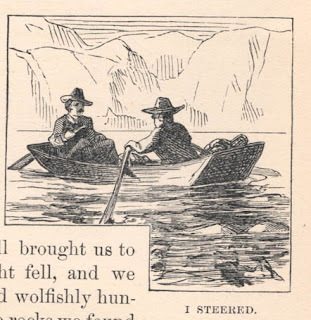 He and a friend went to the lake to stake out a land claim, borrowing a flat-bottomed boat, tools and provisions from a cache left by the Brigade boys (what the Brigade was I am not sure). "At last the Lake burst upon us -- a noble sheet of blue water lifted six thousand three hundred feet above the level of the sea, and walled in by a rim of snow-clad mountain peaks that towered aloft full three thousand feet higher still! It was a vast oval, and one would have to use up eighty or a hundred good miles in traveling around it. As it lay there with the shadows of the mountains brilliantly photographed upon its still surface I thought it must surely be the fairest picture the whole earth affords. We found the small skiff belonging to the Brigade boys, and without loss of time set out across a deep bend of the lake toward the landmarks that signified the locality of the camp. I got Johnny to row -- not because I mind exertion myself, but because it makes me sick to ride backwards when I am at work. But I steered. A three-mile pull brought us to the camp just as the night fell, and we stepped ashore very tired and wolfishly hungry. In a "cache" among the rocks we found the provisions and the cooking utensils, and then, all fatigued as I was, I sat down on a boulder and superintended while Johnny gathered wood and cooked supper. Many a man who had gone through what I had, would have wanted to rest. It was a delicious supper -- hot bread, fried bacon, and black coffee. It was a delicious solitude we were in, too. Three miles away was a saw-mill and some workmen, but there were not fifteen other human beings throughout the wide circumference of the lake. As the darkness closed down and the stars came out and spangled the great mirror with jewels, we smoked meditatively in the solemn hush and forgot our troubles and our pains. In due time we spread our blankets in the warm sand between two large boulders and soon feel asleep, careless of the procession of ants that passed in through rents in our clothing and explored our persons. Nothing could disturb the sleep that fettered us, for it had been fairly earned, and if our consciences had any sins on them they had to adjourn court for that night, any way. The wind rose just as we were losing consciousness, and we were lulled to sleep by the beating of the surf upon the shore."